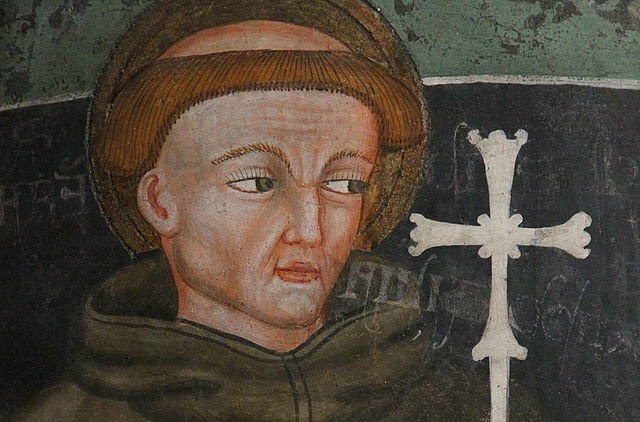 Scientists confirm that the age and content of an old sack is in accordance with a medieval myth about Saint Francis of Assisi. For more than 700 years the Friary of Folloni near Montella in Italy has protected and guarded some small fragments of textile. According to the legend the textile fragments originate from a sack that appeared on the doorstep of the friary in the winter of 1224 containing bread sent from Saint Francis of Assisi, who at that time was in France. The bread was allegedly brought to the friary by an angel. Ever since that cold winter’s night the sack has been guarded by the friary, and today the last few remaining fragments are kept as a relic in a well protected shrine. A Danish/Italian/Dutch team of reseachers led by Associate Professor Kaare Lund Rasmussen from University of Southern Denmark has had the opportunity to conduct scientific studies of the alleged bread sack fragments. Their study is published in the journal Radiocarbon. C-14 analysis revealed that the textile can be dated to 1220-1295. The age is in line with the legend, says Kaare Lund Rasmussen, a chemist, and specialized in archaeo-chemical analyses. The researchers also looked for traces of bread in the textile. They did this by looking for ergosterol, a sterol for the fungal kingdom and encountered in several types of mould. Ergosterol can be a potential biomarker for brewing, baking or agriculture. Our studies show that there was probably bread in the sack. We don’t know when, but it seems unlikely that it was after 1732, where the sack fragments were inmured in order to protect them. It is more likely that bread was in contact with the textile in the 300 years before 1732; a period, where the textile was used as altar cloth — or maybe it was indeed on the cold winter’s night in 1224 — it is possible, says Rasmussen. Scientific measurements cannot prove a legend or belief. What they can do, is either to de-authenticiate the object or show accordance between the physical/chemical evidence and the legend, say the researchers in their paper, published in the journal Radiocarbon. The researchers have not addressed the issue of how the bread sack ended up on the doorstep of the friary. This is maybe more a question of belief than science, says Rasmussen. Click here to access the article “On the Authenticity of a Relic: An Archaeometric Investigation of the Supposed Bread Sack of Saint Francesco of Assisi” from Cambridge University Press.